To locate files that SecureAnywhere classified as "Undetermined," you can generate the All Undetermined Software Seen report. The All Undetermined Software Seen report shows all undetermined software (typically executable files) that SecureAnywhere cannot classify as either safe or as malware. This report lists items by filename, along with when and where SecureAnywhere detected them. This report might show duplicate entries if the undetermined software was detected multiple times or in multiple places. You can also use this report to create overrides and tag files as either Good or Bad, so SecureAnywhere knows how you want to classify them in the future. 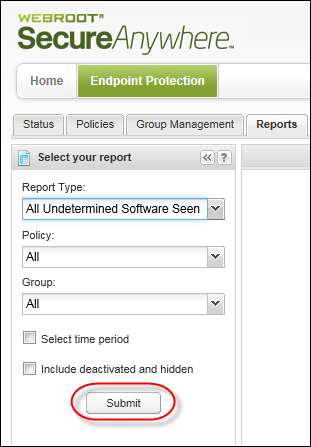 Note: To view the most recent endpoints with undetermined software, see Generating the Endpoints with Threats on Last Scan Report. 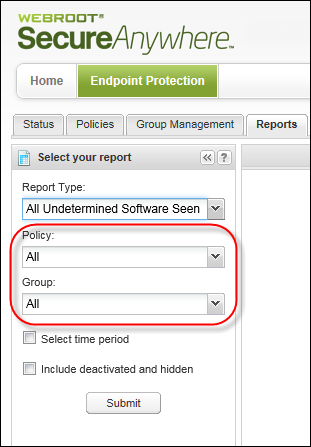 View all undetermined software within a selected policy or group, which is helpful if you need to narrow search results to a specific set of endpoints. Drill down to see the files detected within a date range, which is helpful if you want to narrow the search results to a specific time period. 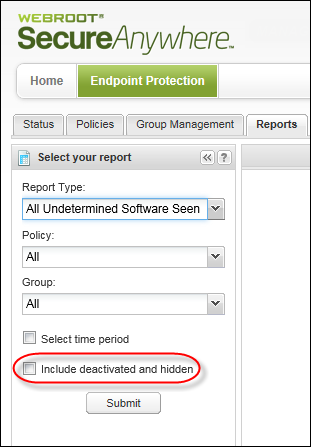 From the Report Type drop-down menu, select All Undetermined Software Seen. 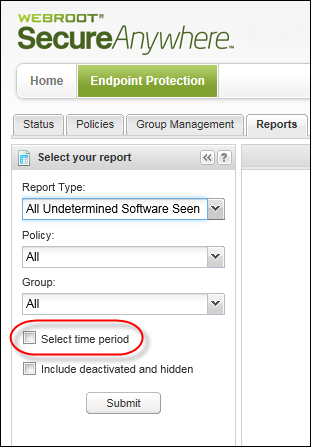 To enter a date range for the data, select the Select time period checkbox. This is an optional step.